The George W. Bush Presidential Library of the future promises it will explore “A Time Of Great Consequence,” and every day we learn a little more about the joy Bush stored up for us. Today’s delight is a Boston Globe report that while Bush was frustrated in his mad dream of sinking your Social Security money into the stock market, he did manage to destroy one big pile of cash. We now know that the Pension Benefit Guarantee Corporation, the shaky entity standing behind your pension, bet the farm last year on the stock market. The losses are still coming in, just as a new round of pension plans collapse into the PBGC’s withered arms. The Houston Press’s Richard Connelly directs our gaze to the George H.W. Bush Presidential Library, where the Living Legend ex-president prepares to honor one of our nation’s heroes. 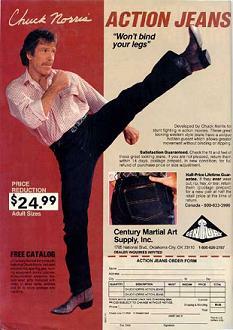 Bush is to present the super-swanky “McLane Leadership in Business Award” to the ever rugged Chuck Norris. 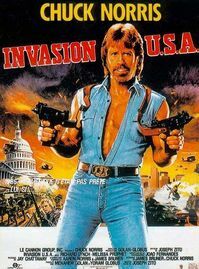 And who needs an excuse to slap up an Invasion USA poster, with the chopper-menaced* Capitol Dome! *Not seen in actual film! Dynamic Gal-On The-Go Meg Whitman may run for California Governor, somehow transjiggering her eBay CEO experience into the state’s salvation. How better to communicate prosperous just folksiness than to pose with a horse, resembling a previous governor. Tragically, it isn’t her horse. Bush’s SMU: Now Paler To Serve You Better! The George W. Bush Presidential Library home-to-be at Southern Methodist University sees the facility as a boon to fund raising and prestige boosting, and of course removing the stain of JFK’s assassination.]. But it may not help on another front: SMU has always had a reputation as a comfortable place for the comfortable, and now the SMU Daily Campus reports the university has gotten steadily whiter over the last decade. Making Richard Nixon’s Six Crises look like nothin! In the same appearance Bush claimed he’d be quiet about the Obama administration, but apparently “drawing comparisons” does not count as criticism.